Product prices and availability are accurate as of 2019-04-20 04:15:40 UTC and are subject to change. Any price and availability information displayed on http://www.amazon.com/ at the time of purchase will apply to the purchase of this product. Author Bookstand is proud to offer Nine New Novellas by Bookstand Publishing. Bookstand Publishing offers books by the best indie authors throughout North America and the world. Bookstand Publishing is dedicated to offering original content to a broad audience and promoting great authors, literacy, and freedom of expression. Nine New Novellas has generated a lot of interest and excitement and we think it would be an excellent addition to your library. Nine New Novellas is author Jay Dubya's fourth story collection written in the spirit of Pieces of Eight, Pieces of Eight, Part II, Pieces of Eight, Part III and Pieces of Eight, Part IV, bringing the writer's novella total to forty-one. 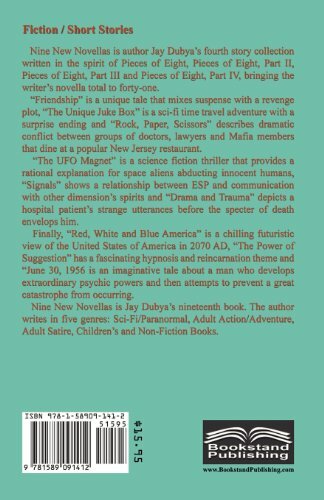 "Friendship" is a unique tale that mixes suspense with a revenge plot; "The Unique Juke Box" is a sci-fi time travel adventure with a surprise ending; and "Rock, Paper, Scissors" describes dramatic conflict between groups of doctors, lawyers and Mafia members that dine at a popular New Jersey restaurant. "The UFO Magnet" is a science fiction thriller that provides a rational explanation for space aliens abducting innocent humans; "Signals" shows a relationship between ESP and communication with other dimension spirits; and "Drama and Trauma" depicts a hospital patient's strange utterances before the specter of death envelops him. Finally, "Red, White and Blue America" is a chilling futuristic view of the United States of America in 2070 AD; "The Power of Suggestion" has a fascinating hypnosis and reincarnation theme; and "June 30, 1956" is an imaginative tale about a man who develops extraordinary psychic powers and then attempts to prevent a great catastrophe from occurring. 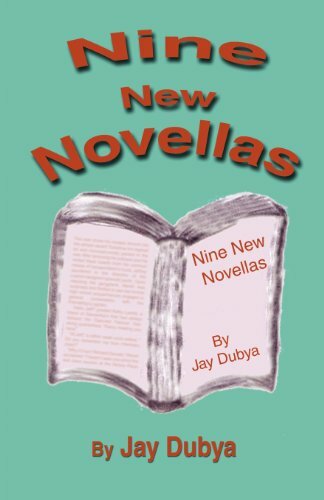 Nine New Novellas is Jay Dubya's nineteenth book. The author writes in five genres: Sci-Fi/Paranormal, Adult Action/Adventure, Adult Satire, Children's and Non-Fiction Books.